FINALLY! Can you believe it! I typed up the pattern directions and scanned in the template for you to use! These little bears are really super easy and fun to make. Mohair can be really super expensive, so if you want to make them, but don't want to use mohair, use wool felt (the good stuff... it's worth it.) fleece, or calico cottons... even gingham would be adorable! I jokingly call these little guys really expensive dog toys... because that is what they remind me of... but seriously tho... they just add the perfect touch of whimsy to a shelf! If you make one, take a picture and add it to my Crafty Carnival tutorials Flickr group! your teddy bear made in belgium ! thanks for the pattern i had great fun in making it. You can find the picture here : http://larubriqueabrac.blogspot.fr/ i made a link towards your blog. the bears are very cute !!! Thank you, thank you, thank you for this adorable project template! 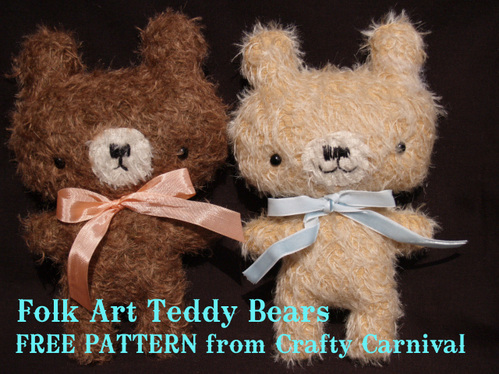 I can't wait to make some of these cute little bears with my girls! I discovered you way back before i started blogging or even really had any idea what a blog was about. I decided, today, to go through my "bookmarks" of favorites so I can subscribe to the RSS feeds of any great bloggers that I've missed (now that I know what RSS is). I'm so, so happy to have rediscovered you! Your weblog gave me lots of inspiration. And the bear is damn cute. Toda raba! I'll try making this bear for my boyfriend. Excellent idea for Valentine's! cute bears!! thank you so much for the tutorial, I tested it, it is very nice! thanks a lot for this funny tutorial. your bears are so cute! I love them. Thanks!!! All of the things you make are so cute! I'm going to try the tooth pillow right now! Thanks heaps!! Thank you so much!!! too cute! These bears are just adorable! OMG these are soooo adorable! I will be making quite a few of these, thank you so much for sharing. thanks !!! it's a very nice bear! I saw you in the Parent's magazine and thought I'd check your blog out.Very cool, especially when I saw the pattern for the silly doll! I can't wait to make a Silly for my "Silly Millie" She loves the stuff I make her and I know she'll love this doll! Thank you so much for sharing the pattern! I can't wait for her to wake up from her nap so we can run to JoAnns!Thanks again! HI! I stumbled on your teddy bear blog. I am going to try to make a teddy bear very soon and am doing research on patterns. Your pattern is very basic, but cute. The kind a small child can hold. Did you find different materials worked better than others? Oh he is just too cute! Thanks for Sharing the directions and pattern! These are cu-ute! Thanks for the pattern! Very, very cute! Thanks for sharing the pattern. My daughter will love it! merci pour ce beau nounours!! happy hollidays and new year for you and all people you love! OMG, they are so cute! Missy--I've just recently discoverd your weblog and I love it! You are very talented and inspiring. Thanks for posting your pattern for the mohair bear--I'll definately give it a go! Thanks a lot for the tutorial! Beautiful! I love this creations!!! Sometimes you need a little inspiration, sometimes you need to find someone who has the same interest as you. Wow, I like this bear pattern. Mostly I made the traditional ones. But they take so much time. This looks like fun to do!! Found you by googling on free mohair bear pattern. And you made my day, thank you!!!!!!!! THANK YOU SO MUCH!!! I have always wanted to make a mohair bear. Your pattern and instructions have now given me the courage. You are so generous!! THANK YOU SO MUCH!! These little sweeties are SOOOOOOO cute! I'm going to make one (or two or more?) for my granddaughter. Too cute! Thanks for sharing the pattern! i am so glad i found you!! you are really cool..i love the bears and cannot wait to try them out!! i am a softy for a worn out bear...thank~you! Too cute! I love the way the ears look on this Ted! Missy - these are great! I just linked to this on Softies Central for a Softies 101 section i'm starting. i often get asked how to start making softies - this will be perfect, thanks! you are so generous! i love your bears and bunnies! so cute! thanks! you should be charging money for your patterns!! That is SO NICE of you to share like that! These are so cute. I have admired your beauties for awhile!! Thanks so much for the pattern - now if I ever actually get around to dusting off that sewing machine! Where would I find mohair? Have you found a source that might be somewhat reasonable? Thanks Missy, you are so generous ! I'v printed out the pattern and instructions and i'v even managed to order some mohair (wow! that stuff is expensive) and little glass bear eyes on the internet - maybee the UK is not so bad after all. While I wait for those to arrive i'm off to mave a wool felt version right now !!! I have been reading your site for months. But these Teddy bears are so adorable I just had to tell you how wonderful they are. Thank you so much for posting the tutorial. And I love your site! OMG....I can't beleive you did it!!!!!!! MIssy you! Counting down the days!